“I consider myself a talented, focused and goal-driven young man. I held leadership positions at high school and this humble beginning made me the person I am today,” says Tinashe Matambo. 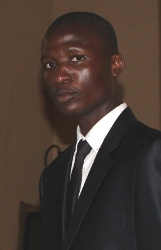 Zimbawean born, Matambo is the first ACCA SA student ever to be awarded a prestigious ACCA Simpson Scholarship. Currently enrolled for BTech Internal Auditing at Cape Peninsula University of Technology, he is very proud of the fact that he has been awarded the Academic Giant Award and the Dean’s Merit Award for the past three years. Aside from his academic achievements, he plays chess and represents Cape Peninsula University of Technology at tournaments. Strength, courage, perseverance, confidence, determination and God’s grace have also, contributed to his personal success. He urges young South Africans to be humble, keen to learn, ambitious, self-motivated and focused: “I have learnt that the decisions I make today determine my future. I have seen some of my peers lose their lives to disease, drugs and alcohol abuse. I have abstained from actions, which could lead to my demise. Young South Africans should involve themselves in sports, reading and philanthropy. Apple Inc. Co-founder, Steve Jobs reminds us that since time is limited, we should not waste it by living someone else’s life. Do not be trapped by dogma and allow the noise of someone else’s opinion drown your inner voice,” Matambo concludes.